On Thursday I walked to work, even though I was a little late. I’d woken later than planned, having failed to set off both of my alarms (yes, I need two). I reached the bottom of my road – the spot where the homeless guy normally sits in the afternoons, feeding the pigeons. Like a lot of wandering drunks, he is split, Janus-like, between spirituous and sage: Some days he’s slumped over, too sozzled to talk. Others he’s as clear as a seer. It was too early for the friendliest hobo, but on the ground in his place lay a perfect white feather. I’m rather partial to a well-placed feather, so I picked it up. Don’t roll your eyes: I don’t necessarily believe a feather is a sign of a guardian angel nearby. 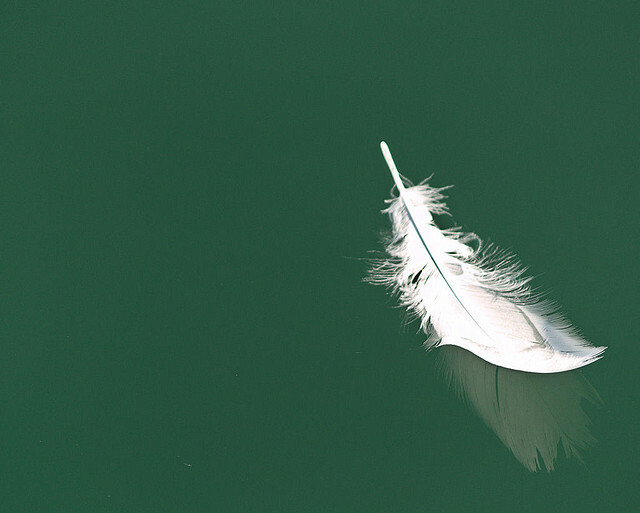 For me, noticing natural beauty, like a feather, can be a cue to more conscious awareness; to being present to what can be seen (and what is unseen) around us. See, stop, think: What’s going on for me right now? And apart from the heavy stuff, holding on to such an ethereal object that’s reached such lofty heights lifts my spirit instantly. I thought about my relationship to breath, my lungs. I thought about my sore throat. I could be getting sick. But I blame having had a few social smokes over the holidays, after months of not smoking. I had my first cigarette at 11. Since then, it’s been an on-and-off affair. When I was 23, I went to see a medical intuitive who used her intuition to “read” messages about her clients in their organs. When she got to my lungs, her eyes welled up. She explained that the lungs are where we hold our emotions. She said she felt my loneliness. I was lonely all right. My identical twin sister and I had just separated, traumatically, and were living in separate cities for the first time. Why do some people desire that feeling of smoke rushing in to their lungs, even after they’ve kicked the nitotine addiction, while others never even get beyond that first sputtering attempt at smoking? Maybe it’s inter-generational. 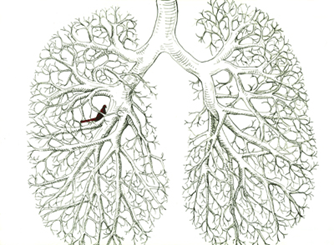 The lungs feature heavily on my paternal side, the Irish side. My father smoked when we were kids; had a bout of pleurisy. His father had a very drawn-out end, battling to breathe for years as a result of emphysema. By the time we knew him, he’d long given up the fags. It was hard to watch him struggle to breathe. But as a teen in denial of death, I was more drawn to his old silver cigarette case, as it was engraved with the initials he and I shared. What more could be going on in the pleura paternus? Psychosomatic Disorders in General Practice traces the long history of linking the interconnected health of the body and mind, from the Bible’s Book of Job to Plato, including the first use of the term “psychosomatic” in 1818, and tracks its development into an interdisciplinary empirical science. In Eloquent Body, doctor, poet and author Dawn Garish brings together the two streams of her life: the scientific, doctor self and the poetic, dancer-writer self, to show how the body is a “battleground for feuding narratives”… how the drive to life manifests in the body, through illness as well as through the act of creating. Since we hardly know ourselves, our symptoms give us feedback on how we are doing in the world. She argues for a more artistic reading of the human body. She mentions Carl Jung’s view, that the soul, being formless, must take its shape through the body. Similarly, the late archetypal therapist and scholar James Hillman’s view on the daemon – the life force that directs you on your journey – suggests it will resort to anything to get our attention. Lung problems mean depression, grief, fear of taking in life, feeling unworthy of life. Emphysema and heavy smoking are ways of denying life. Some of her ideas seem drawn from Chinese medicine. The organs keep a record of their guests. I crossed the road at the Mount Nelson, head still down, wondering about whether my lungs are holding on to a sense of grief and loss. On the other side, on the pavement outside Bertram House, an A5 book covered in red fabric was propped up on its side, page flapping open like an bird about to take flight. One word in capital letters could be seen from my vantage point: “BEREAVEMENT”. It looked like a journal of study notes. I rifled through it quickly, aware of the passengers in the cars beside me, but long enough to get the just of it. It was about carers: Make sure carers are taking care of themselves, it said. The day before, I’d read a moving post by a blogger friend about her 2015 resolution, which came as an epiphany brought about by a bout of illness: To be more selfish; to take more care of her self. Illness is not just a physical thing. It’s not just your body, as modernistic philosophy suggests. A human being is never just a body. A person really needs to take care of themselves emotionally and spiritually. If they don’t do that they’re liable to inhibit healing. Insufficient support and an unrealistic vision for themselves can also inhibit healing. It’s really important to go beyond the physical.Out of all that comes a deepening – not automatically – but a gradual deepening of their sense of who they are as a person. Illness is an opportunity to ask difficult questions. People ask what is important and what isn’t. As I walked past the Michaelis School of Fine Art, I smiled at the beauty of a single morning’s walk. I looked at the ground beneath me and what did I see? Another white feather to greet me.